Bring a pot of water to boil and add the soba noodles and a tablespoon of salt. Cook until tender, about 4 minutes. Drain and transfer to two serving dishes. Meanwhile, heat a small pan over medium heat and add the coconut oil. When the oil is hot, add the garlic and red pepper flakes, and sauté until fragrant – about thirty seconds. Add the kale, stir and carefully pour in the mirin wine. Stir until the liquid is evaporated and the kale leaves are slightly wilted. Remove the pan from heat to stir in the soy sauce and sesame oil. Return to the heat and cook for a minute or so more. Pour the kale and sauce over the noodles, tossing until the noodles are coated. Set the same small pan you just used back over medium-high heat. Crack an egg into the pan, being careful not to break the yolk. When the whites have set, use a spatula to gently but swiftly flip the egg over. Cook for a minute or two until the whites are completely cooked but the yolk is still liquid. 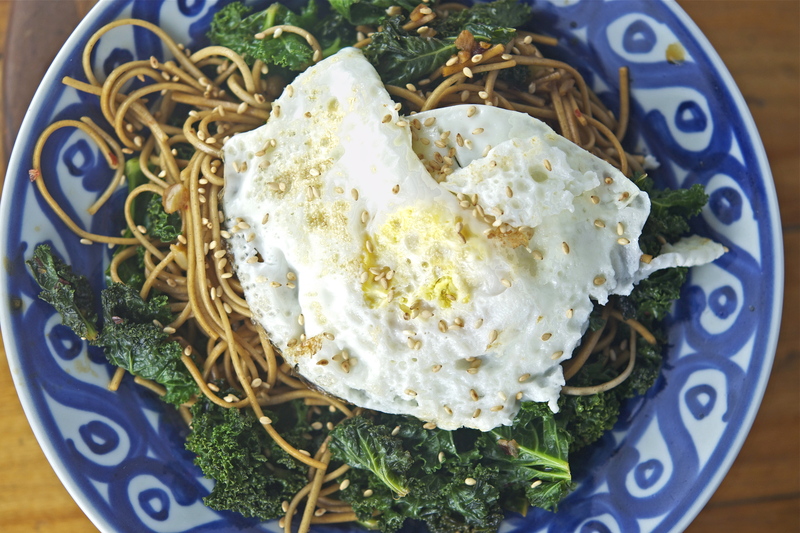 Slide the egg on top of one plate of noodles – repeat with the second egg. Garnish both dishes with sesame seeds and eat immediately!